Surprise!! Rihanna has had her fans on the longest wait for music. To the point they're dragging her left and right anytime she releases anything that isn't music. The pop star acknowledges their thirst by favoriting their requests for the album they have have affectionately named #R8, and even changing her avi to tease them a bit. They weren't expecting her to jump on twitter last night and release her new single.. it was a total surprise. The new jam is proof yet again that Rihanna is an ever evolving artist. Her voice on this record is just delicious to me. The rasp, the twang, the sweet rifts she slides in there every once in a while. The growth is just beautiful to hear. We honestly can't keep up with her. 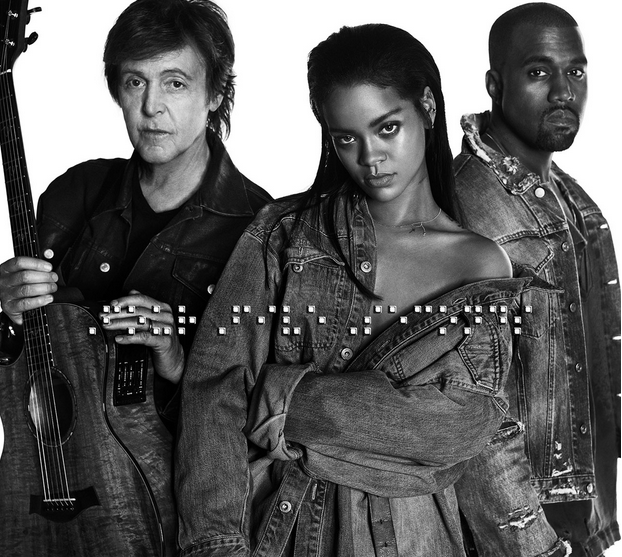 The track FourFiveSeconds features her "big bro" Kanye West, and THE Paul McCartney. Giving country rock tease Rihanna and Kanye sing about that moment you're so super close to whildin' out on someone- we all can identify with that. The richness and rasp in Rihanna's vocals make this song work, and we've grown to appreciate Kanye West the singer. I personally really like the record. It feels very good and it's not something I was expecting from Rihanna or Kanye. Just to have Paul McCartney anywhere near anything you do musically is legendary in and of itself, but I'm glad I actually dig the record! Fans were all super excited last night about the long awaited release, but so was Rihanna. Her bff Melissa Ford posted the below video of Rih's reaction to her song going live online. It's cute that she still gets really excited about her music. Check out the new acoustic song from these musical giants below and get it on iTunes now! I know her fan base is beaming.. I smell the #R8 era upon us.